As many of you know or heard, this year’s Governors Ball music festival in New York City was greatly affected by some summer storms. The storm that arrived on the third day of the festival was so severe that all acts were completely cancelled that day. However, in most circumstances, music festivals and outdoor concerts will go on rain or shine. Windbreaker – a windbreaker, rain coat or poncho is going to be your best friend in the rain. It will keep everything underneath dry and protected from the weather. You can also layer as much or as little as you want underneath depending upon how hot or how cold you tend to get. I love these windbreakers from Fendi and Adidas. Shorts – surprisingly, in the rain, shorts are a much better option over pants. This is simply because it is much easier to towel dry off your legs than it is to air dry a pair of pants or jeans. These denim shorts from Burberry Brit are cute and comfortable. 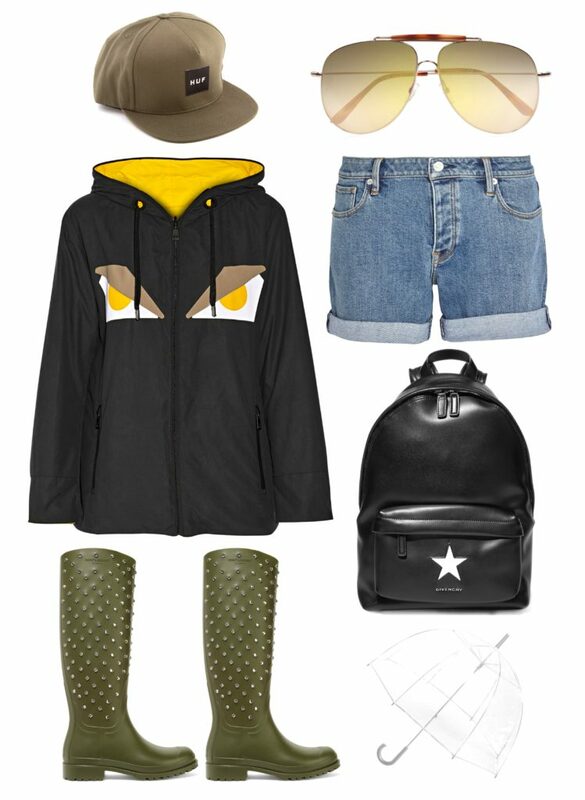 Backpack – never bring your nice handbag to a festival when it’s raining. The water will completely ruin the leather and any other precious materials. Instead opt for a backpack, which is easy to wear and can hold just about anything you want to bring with you. When it’s raining, I always make sure I have wipes, a small towel, an extra pair of socks, a sweater and an umbrella in my backpack. I love this backpack from Givenchy, but there are much more affordable options available from Target and ASOS. Hat or Sunglasses – these items are strictly for style purposes. I personally would wear a hat in the rain to cover up my (likely) messy hair. Rocking a snapback with pigtail braids is a cute style that will keep your wet hair off your face while simultaneously giving your look a little flair. I always keep a pair of sunglasses in my bag no matter what, but they can be especially useful when my eye make-up is running down my face in the rain (ps. invest in a good waterproof mascara. Thank me later). Umbrella – for me, carrying an umbrella to a rainy festival or concert really depends on how much I want to or can dance, and also how many people are around me. You never want to be the annoying person who is whacking everyone with her umbrella or blocking everyone’s view. If you have ample space around you, by all means bring out your umbrella. I love this clear one because you can hold it and also see what’s going on in front of you. Boots – boots are one hundred percent the way to go when it rains. Nothing is worse than wet, cold feet when you’re far from home. I highly recommend a boot that hits right below the knee to keep your legs somewhat covered. Higher boots will also protect you if and when you start kicking up mud. I would wear these studded boots from Saint Laurent even when it’s not raining. They are so cool and fun!